Haha, I didn't for the first couple of days playing. Really annoyed me until I found out. It should be disabled by default, but luckily the settings are remembered. In addition to being annoying, it is also a detriment when you want to cut corners and use shortcuts. I remember being a little surprised and disappointed that the game allows steering assist in online play, because I perceived that to be enabling cheating. Then I realized that if you aren't cutting corners and using shortcuts, you won't be progressing far online! But absolutely the most consistently played and enjoyed game on our Switch. Ironically my seven-year-old doesn't enjoy games as much as other kids (which is fine), but my wife and I will occasionally fire it up and play some 2-player online after he's in bed. Super Mario Maker 2, TLOZ: Links Awakening remake, Astral Chain, Fire Emblem and Yoshi all look to be must buys at this point. Even Oninaki looks great - which is surprising given Tokyo RPG Factory is oh-for-two so far. Daemon x Machina and Marvel Ultimate Alliance 3, not so much. And for me personally, same goes for the 8-bit retro indies. Mario Maker 2 will be huge in our house. My kid loves Mario and making his own levels (even though he's only 4 so they turn out incomprehensible, he still loves it). I played a lot of the first and even had some decently popular levels. Can't wait for that! Also looking forward to Yoshi, that's actually looking more interesting than I was expecting. Couldn't care less about Fire Emblem, snooze. Not sure how I feel about the art style on the Link's Awakening remake but it looks fun. I'm also very happy to have a release date for Dragon Quest Builders 2! Last edited by OutOfTheCube; 02-13-2019 at 04:53 PM. Yeah, my first thought was "it's even more cartoon-y looking than A Link Between Worlds". I hope it grows on me because Link's Awakening is an awesome Game Boy game so I'm looking forward to playing it. Oh yeah totally getting it — I haven’t skipped a main line Zelda game in 15 years. Just wasn’t expecting that look. I’ve watched the trailer a couple more times and it’s already growing on me. Very bright, vibrant, and expressive. I tried the Daemon x Machina demo....still a lot of work to be done their I think. Marvel Ultimate Alliance will probably be similar to 1 & 2, doubt they stray too far from that path. Isn't Tokyo RPG Factory 1 for 2...never played either game but thought I Am Setsuna was well regarded. Yoshi demo showed a lot of potential. It was a very easy demo stage but potential for some depth in the gameplay IMO. Really surprised that Mario Maker 2 is June - felt like it for sure would be December if it landed in 2019. I really wonder if they pushed it up due to delays on some of the other titles. I kinda like what they are doing with Link's Awakening, the art style feels very much like they are just trying to stay true to the artstyle of the original while making it very attractive. Last edited by SuperMatt18; 02-14-2019 at 09:12 AM. Heh knowing Brian and how excited he would be, this is pretty funny. I think I lot of people on the internet felt the same apparently. IaS has been regarded as generally mediocre. And it is. SE hyped that team as developing something akin to a spiritual sequel to Chrono Trigger/Cross, and what we got was a rather bland, grey retelling of Final Fantasy X. It fared well enough financially since the game was cheap to make and the price was relatively high. Personally, I'm surprised SMM2 is a 2019 release. A December release wouldn't have made sense since Pokemon gen 8 will almost certainly drop in November, and Animal Crossing seems like it will hit around the same time. I would have expected SMM2 to be a flagship title for 2020. Last edited by SuperMatt18; 02-14-2019 at 10:58 AM. You know the deal. You know it won't last. Order it now if you have a US address to ship to. They've sold out everywhere in the US so far. Heaven knows how bad it will be in Canada. Last edited by chemgear; 02-14-2019 at 02:44 PM. This is exactly how I feel. Wasn't overly impressed upon my first watch - but it definitely grew on me the more I watched and thought about it. I love that Nintendo is willing to try a multitude of different art styles for Zelda - mostly every game has been so unique. 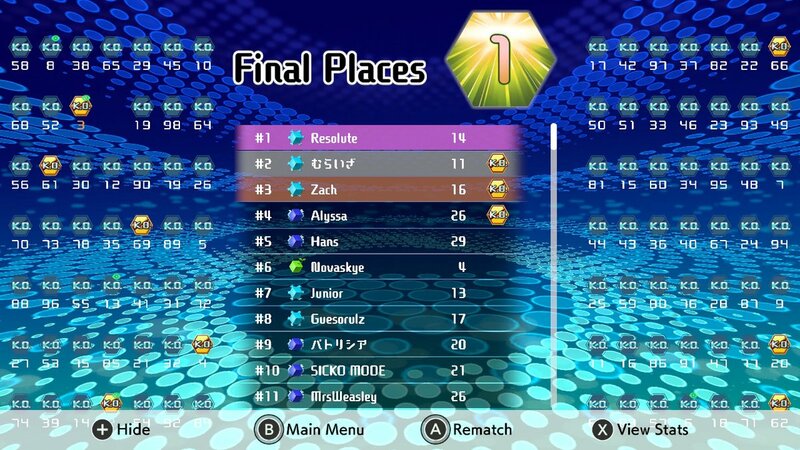 Three second place finishes in Tetris 99 out of about 12 matches played. Just can't get over that hump! My best is 20th. I’m not a Tetris master by any means but it seems no matter how well my game is going there’s always a point where I just get blitzed by like 5 or 6 players at once and have no way of recovering. It’s fun but I think winning is largely about luck of not being targted. Heck I’ve had some games where there’s somehow 10 people targeting me right off the start and I’m gone in less than a minute. Out of 15 games now, top 10 at least 10 times. I tend to attack my attackers, and after it drops to 50 players or so, I stop trying for triples and tetrises and just just clear the board as rapidly as possible. Combos make a difference. What also helps is that I've got about 30 hours of Tetris Effect in, so I'm getting used to being able to continue sliding pieces when they reach the bottom of the board. A thousand hours of Gameboy Tetris where pieces locked the second they touched anything else took a while to unlearn. on the other hand I feel like Link's Awakening DX is already absolutely perfect in 2D and the 3D look kind of cheapens it, and I can't help but wonder if that amazing 8-bit soundtrack will be replaced by something more modern. BOTW's soundtrack was a snoozefest for instance. I did this strategy last night and managed to get a 9th and a 12th, so clearly you're on to something. FINALLY! I was up to seven second-place finishes. 193 lines to win. By far my personal best there too. Most I ever did before was 160ish on PSVR.